My first blood test was in February 2016 following reported exhaustion and listlessness. There were none of some ‘classic’ Type 2 sysmtoms of excessive thirst, blurred vision, need to urinate etc. I remember that the diagnosis was confirmed on 23 February with an HbA1c of 66 mmol/mol (8.2%). It later transpired that in 2010 I had an HbA1c of 45 (6.3%) on a blood test. As a result of total cholesterol of 7.0 I was prescribed Simvastatin (I never took this) without my prior agreement and any explanatory discussion. Actually I have never been one of taking medication if I will help it. 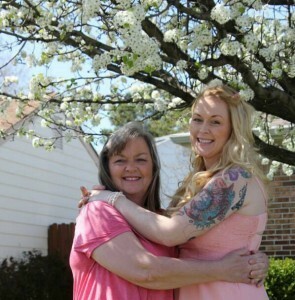 Our human body is always underestimated as a great self-healing mechanism. Some paracetamol per year is usually more than enough for me. It is important. I’m a scientist by training and when faced with something like this then my first reaction is to find out about it plus not take anything at face value without assessing it personally. On the other hand my Type 2 diagnosis was a wakeup call and the kick I had to sort my weight as well as well being out. I immediately started walking for around 50 minutes daily (average). 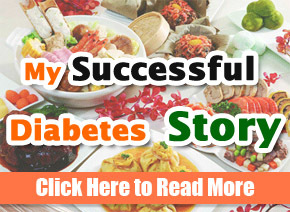 I studied on the internet and found a diabetes treatment video; learned about carbs and the impact on blood sugars levels; could understand the logic of LCHF diets; plus just went for it at 50 g carbohydrates daily –no pasta, no rice, no potatoes, no bread. Thankfully I didn’t have the withdrawal symptoms often experienced by altering so abruptly. And I purchased a blood glucose monitor in the mall and started testing myself. Happily I started losing weight straight away since I got into ketosis plus my body started to burn preferentially burn stored fat for energy. That’s good. I also read about statins and cholesterol and decided that I was not going to touch all of them with a barge pole. I do it myself. Four weeks in and I was already making progress on exercise and diet alone. 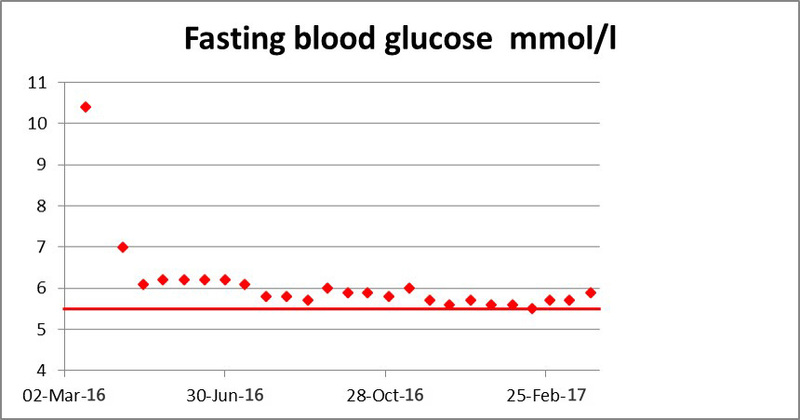 Fasting BGs were down from over 11 mmol/l to about 6.6; pre-dinner BGs in the high 5s; plus BGs 2 hour after eating in the mid 7s and high 6s, hence I was understanding what I couldn’t and could have in terms of my blood sugar management. My weigh went down from 95 kg to 86.8 kg, and my blood pressure was down to about 140/80. I know it was agreed for me to carry on with exercise and diet myself without medication, with a review in four months times. 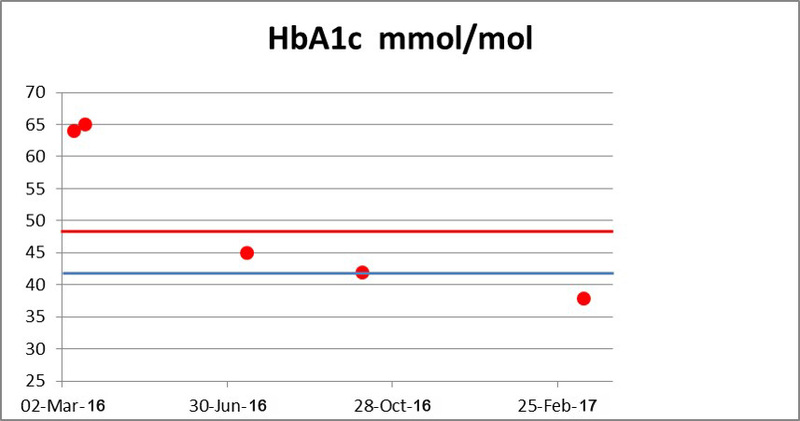 In august 2016 my HbA1c was down from 60 to 45 (6.3%), so that I was in the prediabetic range now. 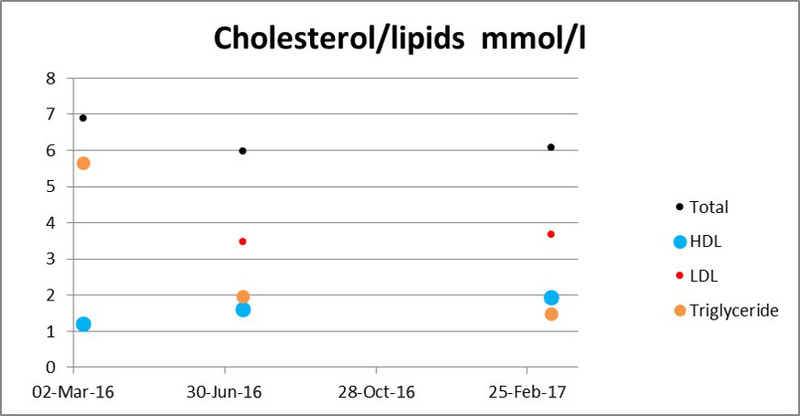 Total cholesterol was down to 6.0, however more importantly the triglycerides were down from 5.67 to 1.98 mmol/l, plus HDC-C was up from 1.23 to 1.63, with triglycerides/HDL and total/HDL ratios both dropping into the normal range. I am happy with that. My weight was down 78 kg (BMl 26.5), a percentage loss of over 16%, plus BP stable about 125/70. 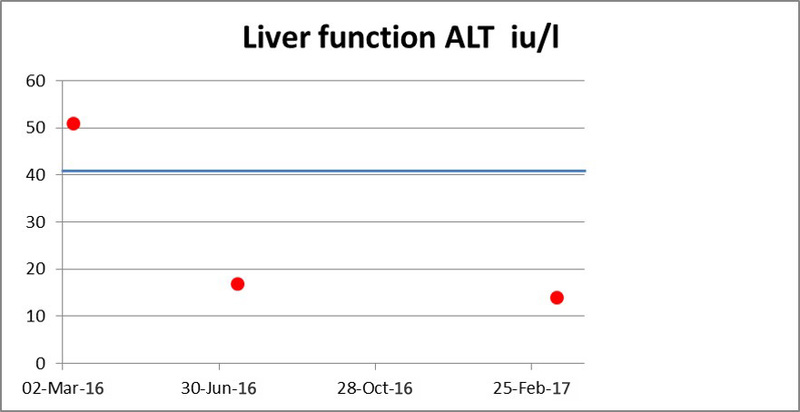 ALT liver function was also down from 52 to 18 iu/l, indicating a totally reversal of my fatty liver condition. 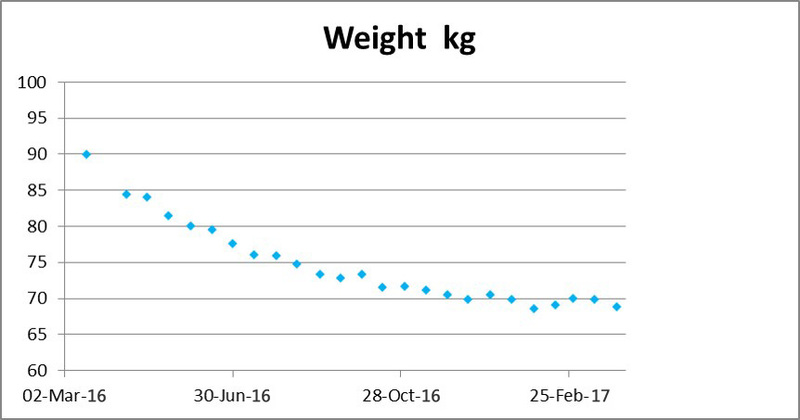 By November 2016 my weight was 70 kg (BMl 25.3), BP about 120/65 and HbA1c was 43 (6.0%). I also have invested in a rowing equipment to supplement the walking. A picture speaks a thousand words, hence rather than more dull and lifeless text, and more graphs below covering the period from February 2016 to March 2017. My HbA1c is 38 mmol/mol (5.6%) now which is surely within the non-diabetic range. 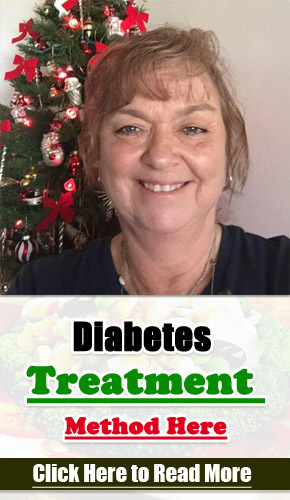 Yet I am still a diabetic However I am protecting my remaining beta cell function in the pancreas as best as I can, plus avoiding exacerbating insulin resistance. 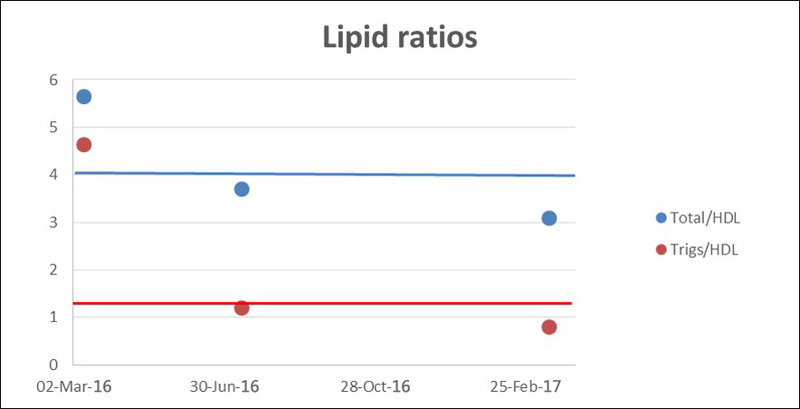 It is all because of carbohydrate restriction, which also has reduced my triglycerides greatly, as well as the fat component of my LCHF diet has also helped increase my HDL-C to 1.95. So in this context the total cholesterol of 6.1 is definitely no concern to me. I feel very good. The slight falls and rises in fasting blood sugar reflect life conditions like work stress – however at least through testing so I know what’s going on. I am happy that my weight is stable at 70 +/- 1 kg (BMI 24.5) now, which represents a 20% loss in a year; and BP about 115/65. And my waist is 36 in (93cm) having been 50 in (118 cm) a year ago. Breakfast – cooked breakfast of tomato, mushrooms, eggs and bacon; and full fat Greek yoghurt with some berries occasionally. Coffee and/or tea with double cream. Lunch –tapas style platter, select from olives, salami, a little hummus, cheese, guacamole, tomato, mackerel pate, salad leaves. Dinner –a glass of red wine, double cream, berries, fish or meat with above-ground veggies or salad, avocado vinaigrette and double cream. Snacks if needed–brazil nuts or cheese. Decaffeinated tea or coffee and plenty of water after midday.